It doesn’t matter who you are or where you work. It doesn’t matter if you’re the sports-nut sales manager or the IT intern who wouldn’t know Larry Fitzgerald from F. Scott Fitzgerald. If you find yourself in an office setting in 2016, you will inevitably end up in a fantasy football league with work. And why not? It’s easy to do and a convenient discussion topic to serve as a digression from the banalities of the normal workday. Anyone can join a league. But not everyone has what it takes to win. I’ve been playing fantasy football since 2008, and I have three championships to my name. I have experienced the euphoria of titles and the despair of missing the playoffs. For all the ups and downs of a season, I can confidently say that there is no better feeling than the one that comes with emerging from the rubble with the trophy in your hands. If you want to experience this glory, just follow these steps. Every year I have a dozen friends come to me with the same plea: “My draft is tomorrow and I need fantasy football help.” Don’t be this person. You should start your preparation weeks in advance so that you are fully comfortable with how your draft and entire season will go down. How many teams are in your league? The ESPN standard leagues have ten teams, but it is common to have leagues of eight or twelve teams, as well. In general, the more teams in your league, the more players who will be owned. That means if you’re in a twelve-team league you will need to know about more players than in an eight-team league, for example. Is it a Point-Per-Reception (PPR) league? Some leagues change up the scoring from traditional methods. The most common custom scoring option is a PPR format. This adds one point (or sometimes a half-point) for every reception a player records. This will mean that running backs who catch passes and wide receivers who are heavily involved will have increased value. Your player evaluation will have to reflect this. Is it a snake draft or an auction draft? Most leagues use a snake draft, where teams pick players one at a time for a round and then reverse the order for the following round. Some more intense leagues use an auction format, where players are put up for “bid” with imaginary money and you have to complete your roster by buying players for the highest price. If your league has an auction, instead of just ranking players before the draft, you will need to address auction values, as well. This is very good to know as early as possible. Which draft position do you have, and how does your league decide this? It’s nice to know which draft position you have in advance because this allows you to have an idea of which players to target at which pick. Your team will look much different if you are picking with the first pick vs. the tenth pick. Also, if your league has an office “competition” for first pick, it’s nice to know about this so that you can prepare in order to get your desired pick choice. You will also want to know the owners in your league. Are they football savants who can name the third-string running backs on every team? Or are they autodraft fillers who know nothing about the game and are only involved for numbers purposes? Is there that one Patriots homer who is drafting Tom Brady in the first round even though he’s suspended and the quarterback position is super deep? Knowing these fantasy archetypes will help you anticipate moves throughout the season so you can take advantage of your opponent's weaknesses on your way to the championship. For example, if you take running back Adrian Peterson in the first round, and your boss is a huge Vikings fan, you can use this to your benefit. He will almost certainly overvalue Peterson, so you might be able to get even more value coming your way in a trade. Knowing how other owners value your players can be a major advantage in building your roster. The biggest step to preparing for your fantasy football draft is to do mock drafts. Not a mock draft. Mock drafts. Plural. The draft is the single most important part of your fantasy season. You want to ace it, and you won’t unless you know what’s coming your way. A mock draft is basically a simulation draft that doesn’t actually create a league. (The league just disappears after the draft, so there’s no pressure). ESPN and other fantasy sites have made this very easy to do. Every day in the weeks leading up to the season there are hundreds of mock drafts that happen online in the mock draft lobby. Mock drafting gives you an opportunity to see which players are going in what rounds and to test out different strategies to see how they affect your final roster. There’s no substitute for mock drafting. If you’ve done many of these, you will be prepared for anything that transpires in the draft. Perhaps the big-shot in marketing snags your targeted wide receiver in the fourth round, leaving you without an obvious alternative. Having mock drafting experience will allow you to make smart decisions in tough places and set you up for success. In addition to this, make sure you do a lot of reading on fantasy football. Popular websites like ESPN, CBS, and Yahoo release a lot of content in the weeks leading up to the start of the season, and they usually provide a valuable perspective on the upcoming year as well as bits of fantasy football help. If you immerse yourself in facts and numbers about a variety of players, you will develop opinions on their value and question your preconceived notions. From there, you can even create a customized set of rankings based on who you are high on or low on entering the season. To do this, I recommend starting with an established set of rankings from a trusted source and then altering this based on who you think is overvalued or undervalued. Even if you don’t do this for every single player, it is imperative to have a general idea of who you like more than your fellow drafters. It’s nice to have some notion of who will be on your team even before the draft begins. I said it in the previous section, but I will reiterate for emphasis: The draft is the single most important part of your fantasy season. While you can’t necessarily win your league with a good draft alone, you can certainly lose it with a bad one. Luckily for you, you’re the most prepared person in the draftroom. You’ve done your mock drafts and identified the weaklings in your league. You are ready to dominate. The most common misconception about drafting is that you want to target certain positions at certain times. Over much of the last decade, it was standard procedure to draft a running back in the first round. However, in recent years, many of these backs have busted, so there’s been a backlash to this movement. I often hear people say they want a quarterback in the fourth round or two wide receivers in the first three. This is not a good mindset to have during your draft. Instead of targeting a certain position, you should be targeting value. If you’re targeting a running back with your first pick and one of appropriate value falls to you, that’s great. However, if the best running back available is a third-round value, don’t reach. Take a wide receiver instead and adjust your plans accordingly. This “best player available” strategy extends beyond the first few rounds, too. If four of your first five picks are running backs, and the best player available in round six is also a running back, it might make sense to take him. If there’s a wide receiver of comparable value available too, maybe you take the receiver, but don’t be afraid of loading up at one position. Even if you come out weak at another position, someone else will need your running back. Since everyone else will have a surplus of wide receivers and a dearth of running backs, you will be in an advantageous trade market position when it comes to relative values. At the same time, it is important to have some balance in your draft. Don’t completely ignore any positions. 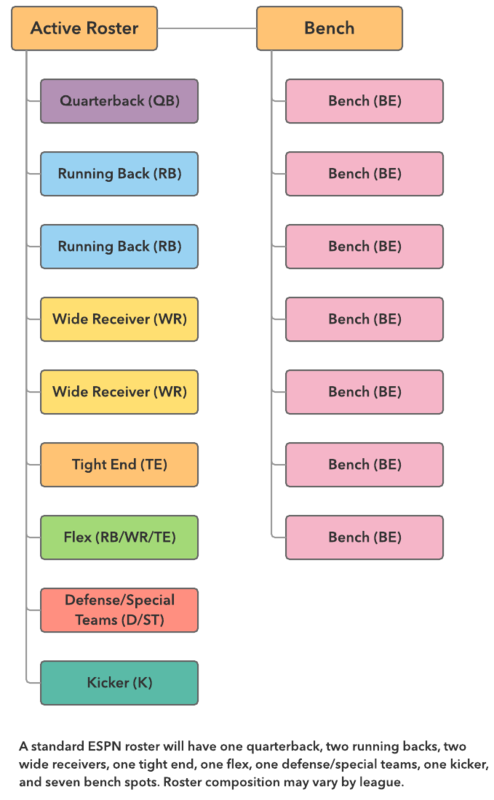 By the mid-rounds, you should have a good idea of your starters at running back and wide receiver, and you should have a plan at positions like quarterback and tight end if you haven’t already taken one. Just as important as positional balance though is balancing players with high floors and high ceilings. Everyone wants the player that’s going to break out. However, oftentimes these players have a wide range of possible season outcomes. In other words, they carry plenty of risk and have low floors. It’s good to have a solid core of players who, barring injury, should put up starter-worthy numbers. One strategy I like is to spend the first four rounds or so on “safer” picks with high floors. This allows me a good base of production so that with my mid-to-late round selections I can target guys with high upside. Then if even one of your late round picks breaks out, you’ve created huge surplus value and have a large advantage over your competition. I feel like this shouldn’t even need to be said, but please DO NOT TAKE A KICKER UNTIL THE FINAL ROUND. Kicker points are extremely random week-to-week and very gameflow dependent. Every kicker has the same value when you’re drafting. Don’t waste a pick on a kicker. Every year I see someone take a kicker way too early, and they never win. Don’t be that person. Also, don’t autodraft. Make a point to be there. You’re better than that. So now you’ve aced your draft. Your team is stacked from top to bottom and the smack-talking has begun throughout the office. So you’re set, right? No need to log in for the rest of the year. Wrong. The year has just begun and you will still need to be very involved if you want to get your hands on that trophy. Every week provides new matchups for your players. If your third running back is facing the league’s number one run defense, you might want to bench him for a different one with an easier matchup. You’ll want to pay attention to these matchups every week in order to start your guys who have the maximum potential to go off. This is especially true for starting defenses, as this is the most matchup-dependent position in the sport. Also, from weeks four to thirteen, certain teams will have bye weeks. You will need to keep track of those so you don’t have an automatic zero from the positions you have filled with players on a bye week. You will also have to manage the waiver wire every week. Even though you’ve done so much preparation and think you know exactly how the season will go, inevitably there will be a few guys who emerge from nowhere to become studs. You’re going to want to own those guys. Remember those high-risk high-upside guys whom you drafted in the final rounds? Well some of them will fade away quickly and can easily be replaced by the waiver wire darlings. However, you should tread cautiously when making waiver claims. Just because a guy broke out in week one does not guarantee that he is now a top fantasy option. If you add players indiscriminately, you could get burned and drop a possibly useful player. Instead, if the unowned player is an unknown, do some research on him. Analyze his role going forward and his chances of maintaining his success. This will help you distinguish the breakouts from the one-week-wonders. Perhaps the most fun part of fantasy football is trades. It’s an opportunity to engage with your league-mates and improve your roster while diminishing theirs. However, don’t make a trade just for the sake of making a trade. I get that it’s fun to do, but if you’re going to make a move, make sure it actually helps your team. If you’re the owner of five starting-caliber running backs but no quality wide receivers, don’t just accept the first trade offer you get. Fellow owners will try to take advantage of your weakness, but it’s up to you to take advantage of your strengths. Don’t sacrifice value for the sake of positional balance. Also, don’t be afraid to walk away from the negotiating table. If you’re desperate, a good owner will smell it and pounce on your weakness. Hold your ground, and eventually you will get what you need. If you follow these steps, you should be in good position to dominate your fantasy football season. Unfortunately, injuries and other unforeseen challenges will always come up during a season. This unpredictability is part of the beauty of the game. The best you can do is maximize your chances of emerging victorious. After reading this, you will be one step closer to your title. What fantasy football help would you like to suggest?